I want to give credit to this recipe to one I saw in this summer's Style at Home. On the Sunday afternoon that I noted it in the magazine, I checked to see what I had in my fridge and modified it to what I had on hand. I also suggest par-baking the crust, which the original recipe does not call for. In a medium bowl, cut butter into dry ingredients to make coarse crumb mixture. Sprinkle with water and stir with fork until dry ingredients are well incorporated and you can shape the dough into a ball. On floured surface, flatten the ball and roll out into a 10 or 11 inch circle to fit tart pan with removable bottom. 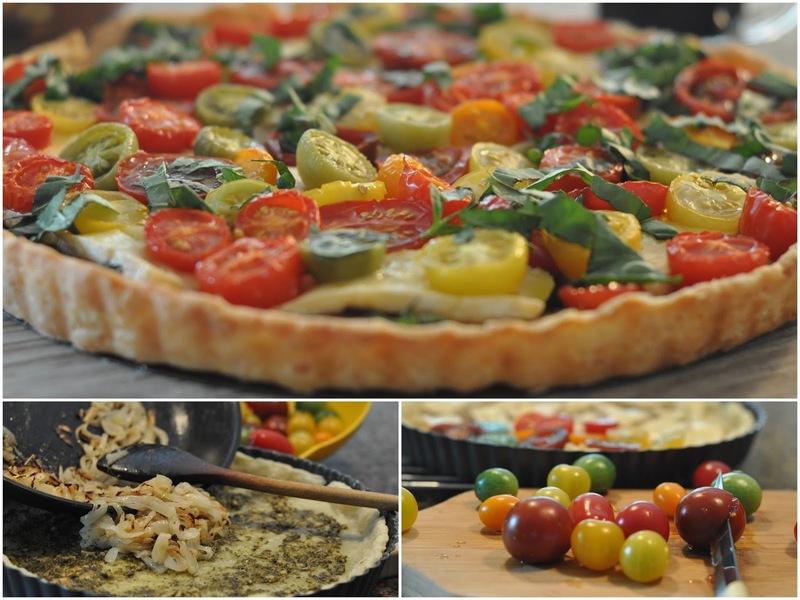 If you do not have a tart pan, you could just use a pie dish or a pizza pan. During this time, saute onion until golden. When tart is partially baked, spread with pesto and then the onions. Continue baking at 375 F for 30 minutes longer. Garnish with chopped basil and serve as is, or with a drizzle of reduced balsamic vinaigrette. Delicious combination of flavors! Flavours I love all together. I would love this! My mom and I made this while camping a couple of weeks ago....it was really great! (Chive-flavoured Boursin was our choice for the cheese :) I'd second the par-baking - we didn't think of it and struggled to get it evenly cooked in the RV oven! This is so pretty! I have printed this recipe and intend to make it this weekend - yum!! !